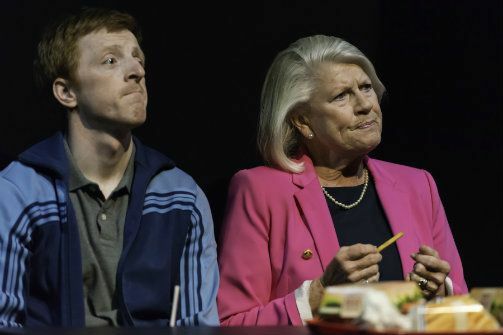 Gavin John Wright and Joanna Tope in A Respectable Widow Takes to Vulgarity. Photo by Jeremy Adams. BOTTOM LINE: This double serving of Scottish comedy packs plenty of laughs and insight into cultural and class issues across the pond. 59E59 Theatres once again brings in guests from across the pond with their annual Brits Off-Broadway festival, during which plays from the United Kingdom do guest stints at the theater. Amongst this year’s offerings is a double bill of two one-act plays from Scotland, A Respectable Widow Takes to Vulgarity and Clean. These holdovers from the Edinburgh Festival played as a double bill at shows in their country of origin. The three are enlisted by the owner of the club to bring down a rival the trio also share a mutual hatred for. Destroying this man and robbing him will be their one big heist that could set them up for life. The trio becomes an edgier version of Charlie’s Angels and together narrate a suspenseful tale of taking down a powerful man and overcoming complex security systems.” On its own, the work feels a bit thin and small but it works as an opening act for the lengthier (and more substantial of the two works) A Respectable Widow Takes to Vulgarity. In A Respectable Widow Takes to Vulgarity an unlikely friendship is formed between Annabelle (Joanna Tope) and Jim (Gavin Jon Wright) as a result of a chance encounter at a funeral for Annabelle’s late husband, who owned the company for which Jim is a low level employee. Jim is easily flustered and becomes so tongue tied in front of Annabelle that he has a slip of the tongue and lovingly refers to her husband as a rather insulting expletive. Jim is horrified and assumes he is going to be fired, but Annabelle’s curiosity is piqued. Annabelle is quite wealthy and speaks in a posh manner whereas Jim is a working class Scottish man who speaks in a manner riddled with slang and vulgarities. Annabelle begins to visit Jim at work and asks him for lessons in swearing and explanations of particular phrases. (I found this to be rather informative as slang in the UK is very different from ours.) Annabelle refers to vulgarities as jewels on a necklace and tries to pepper her daily language with her newly learned words, creating some rather humorous situations. We soon learn, however, that Annabelle’s fascination with Jim and his manner of speech stems from her missing her late husband, who also came from a working class background and spoke in a similar manner before Annabelle integrated him into her world of privilege. While this play is a comedy rife with clever plays on language, it also raises larger issues about class, the role language plays in our lives, and what function vulgarities and swear words serve in our society. Gavin Jon Wright is convincingly naïve as Jim and Joanna Tope is immensely likable as Annabelle.